Teen Titans GO! Movie Must Knows! Forget grim and aged and gritty. DC’s youngest superhero team is leaping to the big screen. 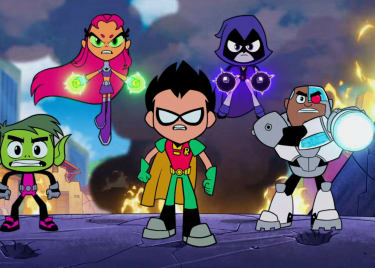 Robin, Starfire, Cyborg, Raven and Beast Boy transition from TV to film when Teen Titans GO! To The Movies hits theaters on July 27. 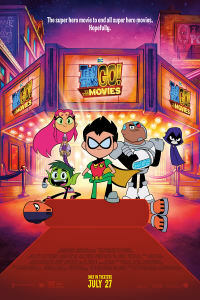 Based on the animated series Teen Titans GO!, the film sees the young heroes determined to have their own movie. When the director tells them they aren’t real heroes, the Titans set out to prove her wrong by taking down the villainous Slade. This movie looks forward to an age of new heroes, but also pays tribute to DC’s past. The trailer alone has loads of DC Easter Eggs, and more will certainly appear in the movie. Miss any? Here are the biggest Easter Eggs in Teen Titans GO! To The Movies (so far). The trailer for Teen Titans GO! To The Movies opens with the words “Coming This Summer” as the Titans sit in a movie theater. The block capitals, black with a gold outline, are immediately recognizable as the font used in promotional materials for Tim Burton’s Batman, in 1989. Burton’s original Batman teaser trailer even ended with those same words. Batman, starring Michael Keaton, changed comic book adaptations. It’s nice to see Teen Titans GO! To The Movies paying tribute to what could be called the first modern superhero movie. As Robin and the Titans eagerly watch the trailer for a film about “Batman’s greatest ally and best friend in the whole world,” The Dark Knight himself appears on the silver screen. Batman, however, isn’t the Teen Titans GO! version. (That one does appear later in the film.) It’s the iteration from Batman: The Animated Series. From the dark red skies in the background to Batman’s iconic grey and black Batsuit, the brief segment pays tribute to Bruce Timm’s designs, as seen on the Emmy Award-winning series. It’s a fitting tribute to Warner Bros.’ most successful animated DC show. Batman: The Animated Series isn’t the only show that gets a nod in this new movie. When the team walks into the Warner Bros. studio, they see a billboard which features Superman, Batman, Wonder Woman and Aquaman. The colors of the billboard and the hero poses are identical to a shot from the opening credits of animated series Justice League — which happens to feature three of the same heroes. Much like Deadpool, Teen Titans Go! takes satirical jabs at other properties, even previous DC films. As the Titans explore the WB lot, they spot a poster for “Detective Chimp and the Case of the Missing Mustache.” It’s an obvious Sherlock Holmes riff, but with the S in “Mustache” mirroring the Superman logo, it’s also clear this is a joke about Henry Cavill’s controversial CGI mustache from Justice League. The ‘stache debacle is referenced again in another Superman movie poster on which the Man of Steel sports a mustache. Justice League‘s use of CGI to cover up Henry Cavill’s facial hair caused quite a stir last year. (Cavill’s mustache was grown for Mission: Impossible – Fallout, opening on July 27.) It’s good to see Warner Bros. and DC open to laughing (a little) about the Justice League decision. The film’s trailer shows Starfire asking Green Lantern if he was lucky enough to star in his own movie. The Lantern proudly confirms that there was a Green Lantern movie… before his face drops. “We don’t talk about that,” he mumbles. This is clearly a swipe at the critically-panned Green Lantern from 2011, which starred Ryan Reynolds as Hal Jordan. Moreover, when the Titans make their way onto the WB lot, we can see all the other superheroes filming their movies in front of signature backdrop locations. 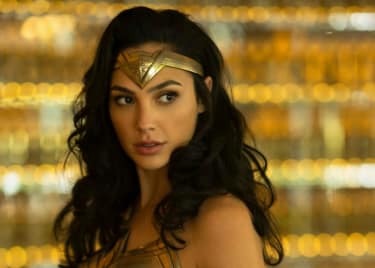 As Wonder Woman poses in front of Themyscira and The Flash stands before Central City, we see Green Lantern acting in front of a green screen — another reference to the CGI-heavy 2011 film. Green Lantern and Justice League aren’t the only DC films trolled by Teen Titans GO! To The Movies. When Jade Wilson, the superhero movie director, informs Robin that she only makes movies about real superheroes, we see a shot of Steel, Jonah Hex and Shazam laughing uncontrollably. Two of these less-famous heroes have indeed starred in their own superhero films over the years, both of which bombed. Shazam’s presence, however, is interesting. That film has yet to be released, so we don’t know how it will do at the box office. Still, it’s a harmless poke at the upcoming film about a lesser-known superhero that not many of us were expecting to see so early into the DCEU. As the Boy Wonder fantasizes about his own big-screen adventures, we see a series of potential logos for a Robin film. But these logos look pretty reminiscent of other iconic superhero films, such as Superman and Guardians of The Galaxy Vol. 2. As Robin struggles to get his own movie, Raven suggests one key factor that could help him out: an arch-nemesis. As she does so, we see a poster for “Batman v Joker: Yawn of Justice”. Even DC and WB aren’t above having fun with the image of 2016’s Batman v. Superman: Dawn of Justice, which was criticized for its grim and convoluted storyline. At some point, the Titans will cross paths with Slade. Voiced by Will Arnett, the sword-wielding assassin becomes the film’s Big Bad, giving the Titans that arch-enemy they need. As this is their big-screen debut, it’s only fitting that the producers chose a villain who shares a rich history with the young superheroes. Teen Titans GO! To The Movies has roots in the 2003 Teen Titans animated series. The same voice cast stars, but the original series was more dark and mature than its successor. Slade was one of the major recurring villains throughout the show’s run. 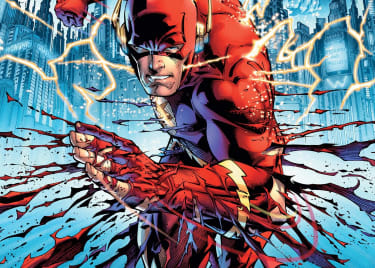 The producers decided to simplify his name to Slade (after the character’s real name, Slade Wilson), instead of using the more comic-accurate alter-ego, Deathstroke. It’s great to see the character’s re-introduction through the world of GO!, and it’s also nice that he maintained the Slade moniker — the ultimate tribute to the show that started it all for these Teen Titans. Teen Titans GO! To The Movies hits theaters on July 27, 2018. Kristen BellNicolas CageWill ArnettAaron HorvathPeter Rida MichailAnimationSuperheroDC Extended UniverseWarner Bros.